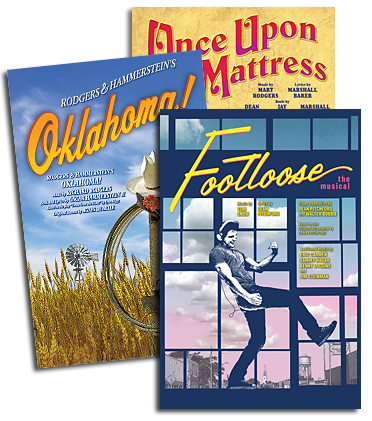 "our Greatest Musical"" Returns To Broadway"
Eight times a week, thousands of theatergoers stream out of the Gershwin Theatre on Broadway, having just spent a couple of hours amidst the cornfields and blue skies of turn-of-the-century Oklahoma. As they pass through the Gershwin lobby and onto the street, they walk under a sign that declares, ""We know we belong to the land/And the land we belong to is grand!"" Those words, written by Oscar Hammerstein II nearly 60 years ago, are from the title song of one of the biggest hits of the 2001-2 Broadway season, and they grab an audience with a forceful vitality unimagined a year ago. If that [song] doesnt make your pulse race, admonished political commentator George Will on ABC This Week the Sunday after the opening, then you have no pulse. Youre dead. Fall down. We, the living, are delighted that OKLAHOMA! has been revived...[It is] our greatest musical. This production of OKLAHOMA!, directed by Trevor Nunn, choreographed by Susan Stroman, designed by Anthony Ward, and presented by Cameron Mackintosh, began life at Britains Royal National Theatre in the summer of 1998. (See Happy Talk, Vol. 6, No. 1) It went on to win every major London theatre award; break box office records at the RNT; play to sold-out houses in a subsequent West End engagement; and earn an Emmy Award for its British film version. Fate, Cameron Mackintosh told the New York Times, is the best producer. In Newsweek, Cathleen McGuigan observed, It seems providential that OKLAHOMA! has landed at a time when were acutely aware of our Americanness, when the bedrock of our history and culture seems particularly precious... OKLAHOMA! is surprisingly welcome once again. In the Associated Press, Mike Kuchwara agreed, Rodgers gift for melody never stops, while Hammersteins lyrics, simple and direct, could not be more welcome. So the context was there, but so was the content. In Newsweek, McGuigan elaborated: Trevor Nunns OKLAHOMA! is a classic musical. Hes taken the work on its own terms, without winking at it or tampering with its essence. Echoed Clive Barnes in the New York Post, This OKLAHOMA! is both a reinvention and a discovery...Rodgers & Hammersteins incandescent collaboration a hymn to the magic of the land, the humor and humanity of people and the simple potency of love comes up spanking new and gleaming. In the Bergen Record, Bob Feldberg explained: There are good shows, and there are great shows. And then theres a show, like the revival of OKLAHOMA!, thats a revelation... This is a grand celebration of a great American musical. Two veterans of the RNT London cast Olivier Award winner Shuler Hensley as Jud Fry, and Olivier-nominee Josefina Gabrielle as Laurey are joined by a dream team of Broadway talent under the musical supervision of David Caddick, and musical direction of Kevin Stites: Patrick Wilson (Tony-nominee for THE FULL MONTY, and Billy Bigelow in the U.S. national tour of the RNT CAROUSEL) as Curly; Tony-winner Andrea Martin as Aunt Eller; Jessica Boevers (RENT, ...FORUM) as Ado Annie; Justin Bohon (plucked from the chorus of SeaBees in the current U.S. tour of SOUTH PACIFIC) as Will Parker; and Aasif Mandvi as Ali Hakim. Cheered Pat Collins on UPN-TV, The entire cast is superb...This is the ultimate production of the ultimate musical! With plenty of heart and plenty of hype (not to mention a $12 million advance the largest ever accorded a revival), OKLAHOMA! returned triumphantly to Broadway on March 21, 2002 one year and 10 days shy of its 60th birthday. Though a star-studded crowd filled the Gershwin Theatre, it was two distinct groups of guests who made opening night special and even a bit historic: folks from OKLAHOMA!, and folks from Oklahoma. Several members of the original 1943 cast were on hand, including Joan Roberts (Laurey) and Celeste Holm (Ado Annie). A very special guest was Shirley Jones, Laurey in the 1955 film version. If the title song got a particularly rousing response on opening night, it was not unexpected: in the audience were 200 Oklahomans, led by their Governor, Frank Keating, joined by Mrs. Keating, state and civic dignitaries, including former Governor George Nigh, Oklahoma City Mayor Kirk Humphries, and famed Oklahoma University football coach Barry Switzer. To Oklahomans, Oklahoma isnt just a showstopper its their state song. At many previous productions, they have been known to clap along, sing along, or even stand up and do all of the above when their song is heard in the middle of Act II. Opening night on Broadway may have inhibited these Okies a bit (no mid-performance standing Os were reported), but they let loose with whoops and hollers during the ecstatic curtain call. In another first, the state co-sponsored the opening night party with Cameron Mackintosh (through private funding and the good offices of local entrepreneur Lee Allan Smith). Invitations that read, Cameron Mackintosh and the State of Oklahoma invite you to... only hinted at the hi-jinks and hoe-down to come at Tavern on the Green, where the twinkling-lit foliage and Versaille-like decor were transformed into a Box Supper Social that would have made Laurey and Curly proud. The dress code (Yeow!) had hopelessly citified New Yorkers and Londoners trying to go West, while award-winning Oklahoma fiddler bands and prize-winning rope twirlers provided a frontier backdrop to the hearty BBQ spread. This is the first time a state has co-sponsored a Broadway opening night, Oklahomas executive director of Tourism & Recreation, Jane Jayroe, told the Dallas Morning News. We think the appeal of the show helps the image of Oklahoma as a place of opportunity and a joyous attitude a lot of things America is looking for today. Rave reviews and great word of mouth helped spark a land run at the box office the next morning. Within a week of the opening, OKLAHOMA! had sold $1.7 million worth of tickets, with seats on sale through the middle of January, 2003. Standing ovations, happy theatregoers: OKLAHOMA! is back, and doin fine. Its first Broadway run lasted five years, reflected George Will. But in a sense, OKLAHOMA!s run has never ended. It is part of the permanent music of American life.